Tagged the “Greatest Show on Earth” by the presenters, Ringling Bros. and Barnum & Bailey, Zing Zang Zoom does pack some punch. A combination of magic and circus, the show is well coordinated and bespeaks well of the long heritage of the presenters. 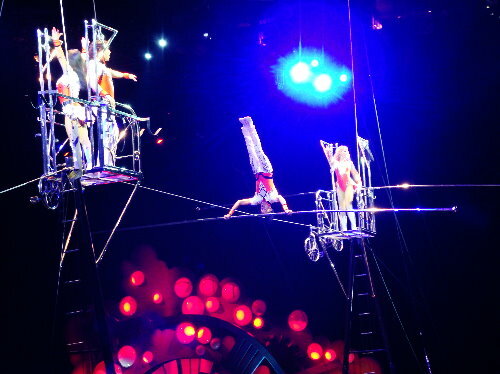 It is colorful, energetic and well choreographed human and animal performances. There were a couple of instances of audience participation. Ticketholders can learn the tricks of the trade in Clown College and meet performers, learn magic and juggling, and try on wardrobe pieces an hour before every performance (except for 10:30 school-group shows). The show starts with a singer on a decorated moving stand belting out their theme song. The clowns, acrobats, floats, elephants et al come in and it is a colorful medley indeed. Tigers in an interesting pose at the circus! The circus performances are interspersed with magic items especially when they are getting the props for the next act ready. 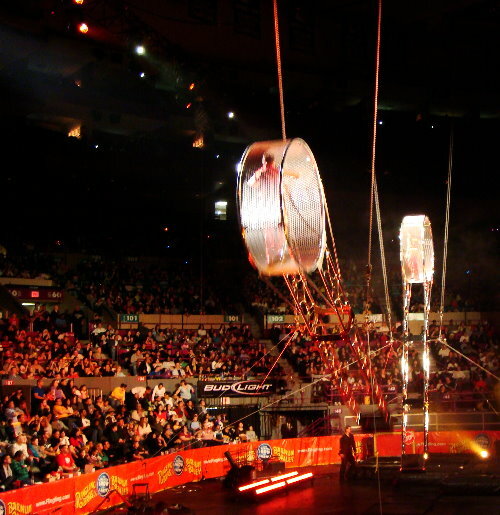 There were trapeze artists on long flowing clothes hung from the huge ceiling of the stadium and trapeze on huge floor swings. Getting ready for being blasted off from the canon! There was tight rope walking and cycling. There were two artists performing upside down, suspended from the ceiling. It looked like they were walking on the ceiling. It was interesting. The choreographed group performances brought in color. The magic shows included the usual – man being cut into two, elephant disappearing, man disappearing and tiger appearing instead, woman going through ostensibly solid steel, scarves turning into doves, man being stretched etc. One of the most interesting items was the canon ball act by a couple who got into separate canons and were shot across the floor onto huge landing pads. It happens very fast but it was fascinating. Wonderful formation by the elephants at the circus. 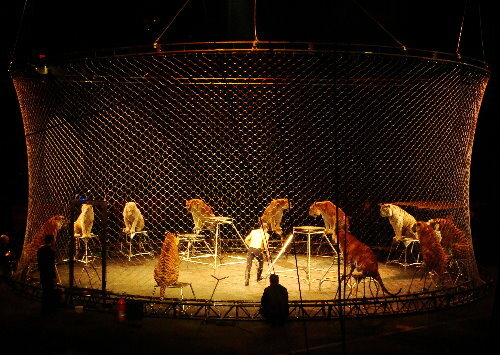 The animal shows in Zing Zang Zoom included performances by dogs, horses, zebras, elephants and tigers. The best however were the adorable elephants and the catty tigers! The elephants (about 11 of them) gracefully troop in and do various antics including an end to end formation with each placing their front feet on top of the elephant in front. Tigers at Barnum & Bailey. The tigers were handled by one man inside a wired enclosure. 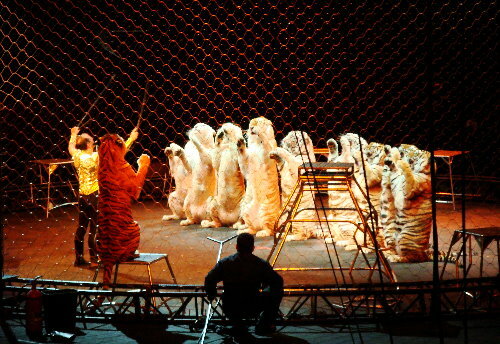 The best of the tiger performance was when they stand in a line on two legs with the front paws held close – they belied their nature and looked like overgrown cats. Overall- a good show. Children will love it. Adults would be interested too. None of the acts extended for too long so all acts actually held the attention of the audience. The performers did a good job. “Zing Zang Zoom” is about two and half hours long with a short intermission in between. In New York, the show was held at the Madison Square Garden. Tickets can be bought online or at box office at the venue. There are coupon codes available for Military veterans. Military personnel can use the online code “ASY”. Circus Celebrity ticket – With this “celebrity” pass one can get to sit right inside the arena for about 15 minutes in middle of the show. Watch the clowns, performers and magicians in action up close. The human canon balls land just couple of feet away from you. As there are only a limited number of this special “celebrity” seats, they are given on a first-come-first-serve basis. 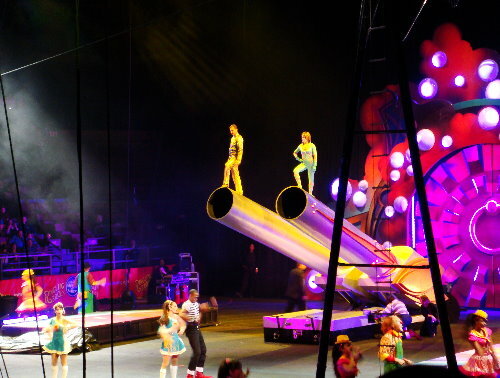 You can apply for it online at the ringling brothers website. Before entering the show, we noticed a small group of people opposite MSG, protesting against the group. 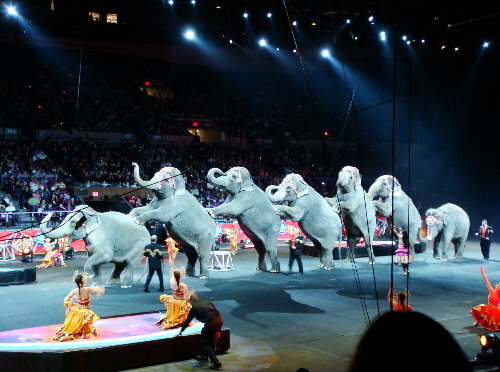 They were protesting against the animal rights violation on the elephants by Ringling Bros. and Barnum & Bailey. We were not aware of it and so we came back and checked on the net. 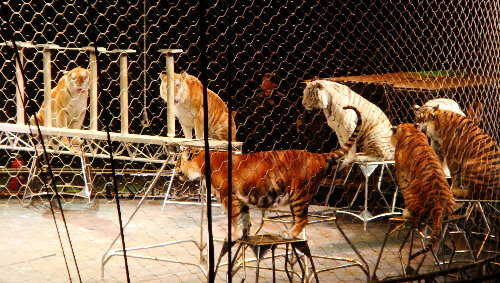 It seems that the circus failed to meet the minimum federal standards for animals used in exhibition as given under Animal Welfare Act (AWA). That explained the huge poster in the centre of the arena before the start of the program, proclaiming Ringling’s efforts on Elephant Conservation. 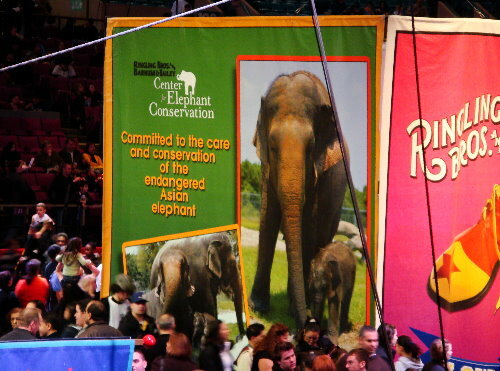 Elephant conservation poster by Ringling at the circus. Though the show was good, we could not entirely enjoy it since the protest outside had sparked a doubt that maybe the animals were not cared for enough. And upon return when we checked we found some details on the site of ARFF – Animal Rights Foundation of Florida and animalliberationfront.com.